Frigidaire Dryer Error Fault Codes help you diagnose a problem with your Frigidaire dryer. Frigidaire Dryer Error Fault Codes are shown on your dryers display to help you troubleshoot the problem with your dryer. Our error codes below will help you to identify what is wrong with your Frigidaire dryer. Once you have identified the error code, this will tell you which part is causing the issue. You can then check the part in question and clean or replace it if needed. Frigidaire dryer help videos are here if needed. 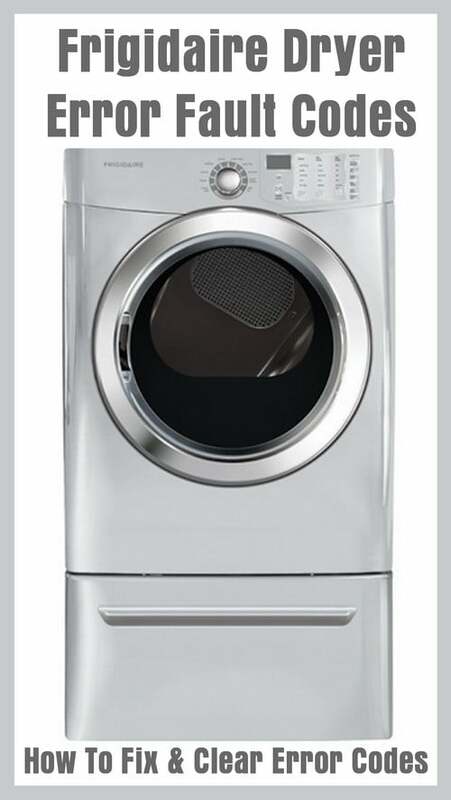 NOTE: On Frigidaire dryer models that do not have a digital display… the four indicator lights on the dryer = Drying – Cool Down – Wrinkle Rid – Clean Lint Filter… will flash a light a certain number of times to indicate the first digit of the error code. The start light will flash a certain number of times to tell the second digit. The Start light will flash 10 times for the letter A. The Start light will flash 11 times for B. The Start light will flash 12 times for C. PLEASE NOTE: The above flashing lights information is for a Frigidaire dryer that DOES NOT HAVE A DIGITAL DISPLAY. If your Frigidaire dryer has a digital display and shows an error code… see below. Check or Repair = Remove the dryer from power for 10 minutes to try and reset the main control board. Apply power back to the dryer. Start a test dry cycle to see if the error has cleared. If the error code comes back then replace the electronic control board. Check or Repair = Remove the dryer from power. Use a multi-meter and check the resistance of the temperature sensor (thermistor). The thermistor should measure 50,000 ohms. If it does not show the correct ohms then replace it. Check or Repair = The normal dry time for the drying cycle has exceeded the time limit. This error code shows a problem with the heating system. Remove the dryer from power and check the heating element if electric or gas burner components if it is a gas dryer. Replace faulty parts. Check or Repair = Remove the dryer from power. Check the heating system and components. If you have an an electric dryer be sure to check the circuit breaker to see if it has tripped. If you have a gas dryer be sure that the gas supply cut off valve is completely open. Check or Repair = If the stuck key cannot be freed or fixed by attempting to adjust it then replace the electronic control board. Check or Repair = The high limit thermostat will trip if the dryer exceeds the heat limit. Check the exhaust vent for any clogs of lint. The dryer may heat constantly if a relay on the electronic control board is stuck in the closed position. Replace the electronic control board. If you need assistance with an error code on your Frigidaire Dryer, please leave a comment below and we will be happy to assist with troubleshooting the issue or giving you the definition of an error code not listed on this page. Is there a reset for the Frigidaire FASE7073LRO. I’ve replaced the door striker, latch, and switch and door open error still displays. My affinity dryer model aeq6700fso is stuck in loc error code. Lights blink on right side after 15 mins no error code. No heat . On display where it usually says how long left to dry it just has a circle spinning. What does the error code ad on a Frigidaire front load dryer mean? NOT AN ERROR. The “AD” in the display would indicate the auto dry cycle has been selected, and the dryer control is trying to determine the needed drying time. I keep getting the e68 error. I have done the full test mode and all lights are lighting up and flashing in a group as normal. I have removed the control panel and tried to repress the button that I believe is the main problem to get it to work by just touching it with a screwdriver to get it free but no results. Just when I put it all back together and start the dryer, it runs for 20 seconds and beeps for hours if you leave it without unpluging it. Frigidaire model FAQE7072LR0. Drum light is on, power coming from both sides but no digital display. Faint blinking. No noise, or running. I have a Frigidaire affinity and the timer will count down for a couple of minutes on the digital screen and then 2 lights circle the screen for the rest of the dry time. Why is this and how do I make it stop? I have googled a little bit and read that it is because of the wrinkle guard, but I have turned that off so please help me understand why this is happening. My Affinity dryer will stop running after 10 minutes. There is no error code, no heat, no time displayed, just 3 flashing lights. I cannot get it to display any error codes. I am at my wits end, this dryer is less than a year old! My Frigidaire Gallery series shuts off in the middle of any cycle and flashes Ad. I can cancel and restart the cycle and does the same thing. I’ve got a Frigidaire gallery series dryer and it shuts off in between the cycle and flashes adj no matter what size load is in. I’m guessing it means adjust? My error code is PF. Dryer tries to run but stops and shows PF. The dryers lights on the cycle status flash. I have tried various settings . Nothing seems to work. Any suggestions? It’s an Affinity dryer that is stacked on top of the washer. By the way, I have to leave the washer door open or it will smell musty. Any help with this, also? I have a Frigidaire dryer model #FARE4044MW1. My dryer lights up but will not run. It gives code 61. 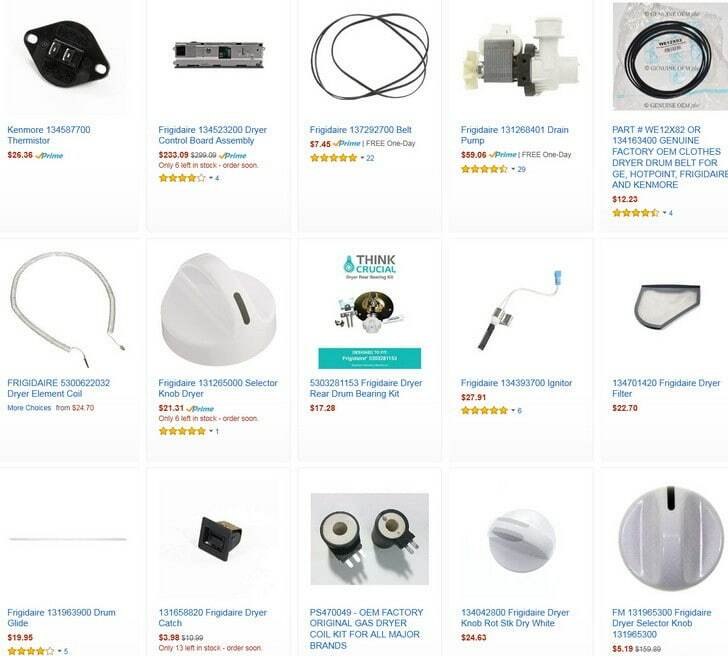 I have tried the Frigidaire site with no luck as well as my manuals. Nothing for codes listed. Please help! I have done a factory reset and also flipped the breaker. If I flip the breaker it will run for like 2-3 seconds then turn off and show code 61 again. It says to call service what does the code mean? I used the dryer the other day and it worked find and I went to start it and that is the error I got. I have a Frigidaire Affinity model AGQ6700FS2. The control board was replaced after a storm caused a power surge. Since the board was replaced an ad code appears. I cleaned the sensor bar in the drum as well as a large amount of lint from the edge of the drum lint screen and the immediate exhaust compartment. The dryer cycle continues then after the majority of drying time a dn code appears. The dryer stops automatically and the clothes are dry. During a test cycle after the dryer started I cut the power for 10 minutes then repowered the dryer. I turned off the cycle then restarted another program and the dryer showed the same ad code and the clothes dried and the machine stopped at the appropriate time interval. I did not see if the dn code appeared as i did not watch the machine during the whole cycle. I have a Frigidaire affinity dryer and it keeps saying error code 91. The Frigidaire affinity dryer E91 error code indicates that you have a problem with the electronic control board in the console. I have an older model no digital display. It does not beep 10, 11, 12 times. It beeps 6 times. My Options are Drying, Cool Down, Press Saver, Clean Lint Filter, Control. The Control light is locked on. How do I turn it off? And, what does 6 beeps mean? My frigidaire gallery series dryer is stuck in the loc mode , beeping and lights flashing , there is no error code , I have unplugged it and re plugged it to no avail . Frigidaire dryer is giving me a E61 error code. My Frigidaire front load dryer will come on only for a few mins then shuts off and says EF1. What does this code mean? My Affinity dryer has LOC code on. How do I get it off or clear it? My dryer reads “door open” even though the door is shut. Because of that it doesn’t allow you to do anything else. Affinity dryer has E02 fault code. Dryer burner does not light. What does this code mean? My Code was EF1…. not listed anywhere. Our dryer repair guy could not find that code listed anywhere on his reference material. He could however see it on the digital display on the dryer as he scrolled through so we were not imagining things. End result was we had our dryer vent cleaned-that was the problem. Our vent comes outside on the roof (stupid design) where you have to have a professional clean it (no way to do it yourself). There are very few furnace companies around here that will do that because it is too dangerous and they need special equipment and insurance. This is common with newly built houses that have laundry facilities on the second floors. Dryer begins, heats and then shuts off after approx 6 mins with the above message and a continuous beeping sound. After checking the dryer vent on the outside of the house(with the dryer running), there appears to be no air being forced out the vent. Inside the drum, on the back wall, part of the area where the heats comes from is black in color and the surface feels burned/rough to the touch. Error code E61. It started after we had the heat coil or something like that replaced. I read something about maybe a fuse of some sort not being strong enough but really have no clue. And maybe, if u do respond, please feel free to explain and give directions to me as though i am a 3 year old. I wont be insulted at all. Thank you. You will need a multimeter…. Check for short circuit across heater relay (RL5, RL6, RL7) or L1 applied to heater relay output(s) (J5-2, J7-1, J7-3) with cycle stopped. Check for open circuit between L1 and heater relay connection(s) (J5-1, J5-3, J7-2). If no wiring problems are found, replace Electronic Control Board and retest. Replaced Thermal limiter on the burner. Dryer worked again for 15 min the tripped the limiter again. Is the Thermal limiter the same part on the burner side and the blower side? What would be causing it to trip? Exhaust is clear, and everything has been cleaned out. My frigidaire dryer says error code “COL” and won’t start. I have the error code E9E, but can find no reference to it. Our Frigidaire Dryer says Error E67. Do you know what that error message is? It then ran with heat and said error E64. Which I see is the heating panel but our is getting hot. Our Affinity dryer is stopping 15-30 minutes into a timed cycle. There is no error code displayed – just the time left in the cycle – but the 3 little lights on the right side under the display continuously flash. It doesn’t feel like it’s heating while it does run. When it stops I can hit cancel and start the timed cycle again and it will run but again only for 15 minutes or so. Any ideas on what the problem might be? My Frigidaire front loader dryer won’t start. I get a “dr” message with top 4 lights flashing. Make sure there is nothing blocking the door. Check the wiring from the door switch assembly to the control board. The dryer may have a control board failure. The relay that controls heat can burn the terminals for the wiring. Inspect these relay connection by removing the front control panel. Also… try setting the machine to the fluff/air dry setting and try starting the dryer. If the dryer starts in air fluff, then you need to check the connections on that relay. On some Frigidaire Front Load Dryers, the dryer will still run in fluff mode if the board is faulty. Frigidaire Affinity dryer runs about 30 seconds then shuts down and displays error code E91. My Frigidaire affinity dryer is displaying the code E 64 and isn’t heating up? What could it be? The Frigidaire affinity dryer displaying error code E64 means the HEATING ELEMENT is bad or not connected. This is why the dryer will not heat. Remove and replace the dryer heating element. My Frigidaire dryer (gallery series) Runs for approx. 10 minutes then an error code Ad comes on. Then it stops and all the lights flash, also noticed no heat! Any ideas? The Frigidaire dryer showing code “Ad” indicates the auto dry cycle has been selected. The dryer control is trying to determine the needed dry time. The Estimated Drying time for the cycle selected will be displayed for 5 minutes. The code “Ad” is displayed until the Estimated Drying Time for your specific load has been determined. Clean the sensor bar in the dryer drum. Use rubbing alcohol and get any build-up of lint or debris off the sensor bar. My Frigidaire affinity dryer keeps telling me error code e68. Does anyone know how to fix this?! Error code e68 on a Frigidaire affinity dryer indicates a stuck key on the dryer control panel. You can try replacing the control board overlay if you believe there is a STUCK KEY. If there is no stuck keys, the control board itself should be replaced. You can sometimes fix the stuck key be removing the overlay and adjusting it. Are you getting any blinking lights with the error code e68? Frigidaire dryer error code E66. What does the error mean? How can I fix this myself? The Frigidaire dryer error code e66 means there is an issue with the dryer door lock switch assembly. Check that the door is shut properly. If so, there could be a wiring issue within the door that connects to the main controls. The door switch circuit must be closed for the motor to operate. A faulty door switch may be the issue. The door switch can be checked with a meter. When your dryer will not run, then another issue could be the thermal limiter/fuse. Frigidaire clothes dryer has code E61 after 10 minutes. Can you tell me what is wrong and how to fix it? Heater relay stuck open or closed or Wiring defective. Check for short circuit across heater relays or heater relay output with cycle stopped. Check for open circuit between L1 and heater relay connection. If no wiring issues are found then replace Electronic Control Board and retest. What does it mean when it says “Ad” and the drying, cool down, and extended tumble lights are flashing? Most likely you have a bad heating element. Check wiring and heating element for faults.